The health care industry is one of the largest industries in the world, and it has a direct effect on the quality of life of people in each country. Health care (or healthcare) is the diagnosis, treatment, and prevention of disease, illness, injury, and other physical and mental impairments in humans. Health care is delivered by practitioners in medicine, chiropractic, dentistry, nursing, pharmacy, allied health, and other care providers. The health care industry, or medical industry, is a sector that provides goods and services to treat patients with curative, preventive, rehabilitative or palliative care. The health care industry, or medical industry, is a sector that provides goods and services to treat patients with curative, preventive, rehabilitative or palliative care. The modern health care sector is divided into many sub-sectors, and depends on interdisciplinary teams of trained professionals and paraprofessionals to meet health needs of individuals and populations. This article provides an overview of medical industry. This article provides a short history of healthcare industry and discusses major world events that impacted and shaped the healthcare industry as it stands today. This article briefly traces global healthcare history from ancient times to colonial era to the modern day. This article also discusses various ideologies that have dictated the path of global health and set the trend towards globalization of healthcare sector. Health Care or Health Insurance is similar to general insurance. As you know, in any insurance, insurer (Insurance company) will provide the plans and customer (Subscriber or Policy holder) will buy policy of his desired plan. Insurer will receive the premium amount from the policy holders and the policy Holders will get reimbursements from insurer for the valid claims they have submitted. The same happens in healthcare insurance but in addition to insurer and policy holder there are other major contributors such as provider, TPA (Third Party Administrator), BROKER, etc. An entity which creates plan, sell policy and reimburses policy holder or provider for the submitted valid claims. A person or an entity, who buys the policy from the insurer or BROKER, pays premium to the insurer and sometimes submit claim. A person or an entity, which provides the health care service to the policy holder and their dependents, either receives payment for the service from the policy holder or from the insurer by submitting a claim. A person or an entity that manages the claims of policy holder or provider and receives payment for the management from the respective contributor. As you have guessed, he is an agent who sells policy to the customers on behalf of insurer and receives commission in return from the Insurer. 7.) Member – Who receives medical coverage under a subscriber. Dependents of the family. 8.) Claims – “An invoice from the provider to the doctor for the services rendered”. 9.) Coinsurance – A form of medical cost sharing in a health insurance plan that requires an insured person to pay a stated percentage of medical expenses after the deductible amount, if any, was paid. 11.) Deductible – A fixed dollar amount during the benefit period – usually a year – that an insured person pays before the insurer starts to make payments for covered medical services. 12.) FSA (Flexible spending accounts or arrangements) – Accounts offered and administered by employers that provide a way for employees to set aside, out of their paycheck, pretax dollars. Can pay only medical expenses. Money lost if unused. FSA can cover childcare expenses, if setup separately. 13.) MSA (Medical Savings Account) / HSA (Health Spending Account) – Savings accountsdesignated for out-of-pocket medical expenses. Employers and employees can contributeto this and are pre-taxed. Can carry unused funds into future year. Are normally combined with high-deductible or catastrophic health insurance plans. 14.) Fully Insured Plan – A plan where the employer contracts with another organization to assume financial responsibility for the enrollees’ medical claims and for all incurredadministrative costs. How to test health care application? Before testing an application, we should be aware of healthcare industry work flow. The previous topic just gives an introduction to managed health care, more details are available here. For example, Provider system can be part of Member system in some healthcare application. By healthcare application I mean a set of systems maintained by an Insurer to facilitate their customers and partners. • For a member/policy holder to be enrolled in a health plan he/she need to be assigned to a provider (Primary Care Physician) or a provider network, so there should be a way for member system to validate the assign provider. Either member system connects to the provider system or a data feed should periodically sent to member system from provider system. Therefore provider system should be tested and ready to use before testing member system. • A claim should consist of provider ID and member ID in addition to other details. Claim system should validate both the member and provider in order to validate the claim, so both member and provider system should be tested and ready to use before testing claims system. • Finance system need to have data from member, provider, and claim and BROKER system to write checks or make EFT payments to the respective person or entity. • Provider and BROKER systems are stand alone. • Portals should be tested at last since it needs data from the other applications. 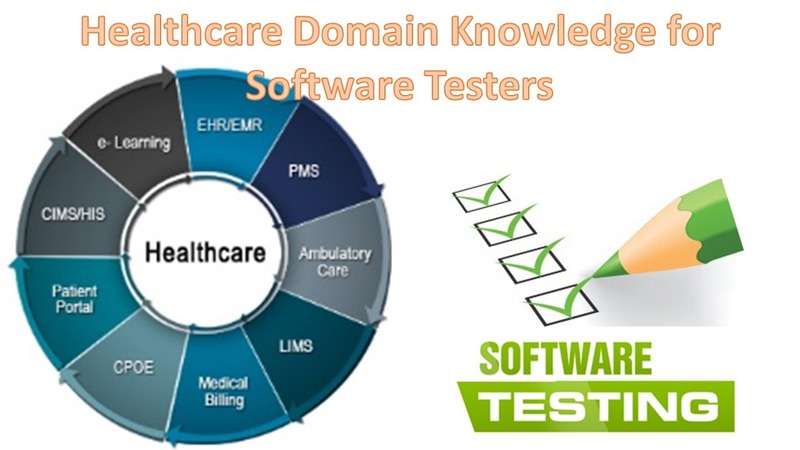 Testing healthcare software is a difficult task for testers as it requires a vast knowledge of the domain. It also poses many challenges because of the complexity of the design, diagnosis, and the day to day development of the patient. Moreover, the product needs to conform to various Safety and Regulatory Standards such as IHE, HL7 and others. Testers should be aware of the various standards in the healthcare domain such as DICOM, HIPAA and others while testing the product for various aspects. Testing a healthcare product without having knowledge of the various standards will result in the inadequacy of testing. Testers should be well aware of the various functionality, clinical usage, the environment the software will be used and others while testing healthcare products. If the healthcare product is not tested adequately for safety and hazards, it will have a fatal impact not only on the product but also on the patient. Testers must be able to identify the various hazards and their impact. Healthcare products also need to comply with various standards like FDA, ISO and CMMI before they can be used. Testers must be well trained on the various standards so as to ensure that the product meets the requirements of the various standards. Complex software has different components and layers. Changes in one component or layer can lead to some side effects on the other. Testers must ensure that there will be no side effects on the other layers whenever there are changes.